Pump demonstrations available for local clients- call for an appointment! Now the favorite hand pump is available in a double electric pump!! AVENT took everything women loved about the classic ISIS � the soft petal massager and fingertip sensitive control that makes it feel so gentle, natural and comfortable, almost like your baby suckling - and added an iQ � an electronic brain. The result � an ultra-quiet, intelligent twin electronic pump which, unlike ALL others, gives you infinitely variable control at your fingertips � on the breast, where you need it. 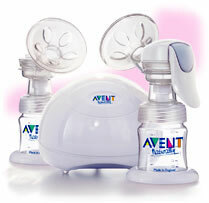 Avent Isis IQ Breast Pumps are the first to be designed with an iQ...an electronic memory that learns from you! Isis iQ DUO and Isis IQ UNO are the most personal electronic breast pumps you will ever own. both feature the advanced Isis IQ technology, which instantly responds and adapts to each pumping session, and are also designed to give you the ultimate in comfort and convenience. Its quiet, good looks mean you'll be happy to have it in your home or office. You can transport and store it in its specially designed stylish executive bag. And because AVENT thinks of everything to help you breastfeed longer, iQ DUO comes with your own CD of 'Sublime Sounds for Serene Mothers' played by the London Symphony Orchestra � guaranteed to help you relax. Because when you're relaxed, you'll produce oxytocin more easily � the hormone needed to get your milk flowing. Begin pumping manually. ISIS iQ learns your gentle touch and when you�re ready � quietly, electronically � takes over your rhythm. Express effortlessly from both breasts at once. Change your pumping rhythm any time you wish. Relax and enjoy the experience because you�re in complete control. And when you�re relaxed and comfortable, you express more milk faster. The Isis IQ Duo can cycle at more variable speeds than any other pump on the market. Because it is controlled by your programming, you can go as slow as 20 times per minute to hold the breast longer during the let down reflex and as fast 160 times or greater to elicit the let down. The Isis petal massager inserts for the pump are the standard 24mm size. If a larger flange size is needed, the inserts can be removed to allow a 27mm size. Avent is looking into making larger flange sizes, but at this time only two sizes can be used for pumping. Wish to add the Vehicle Adapter?